So I’m off on my latest cycle tour, this time with the indefatigable Uncle James along too for a holiday celebrating (a few weeks early) 20 years of marriage. 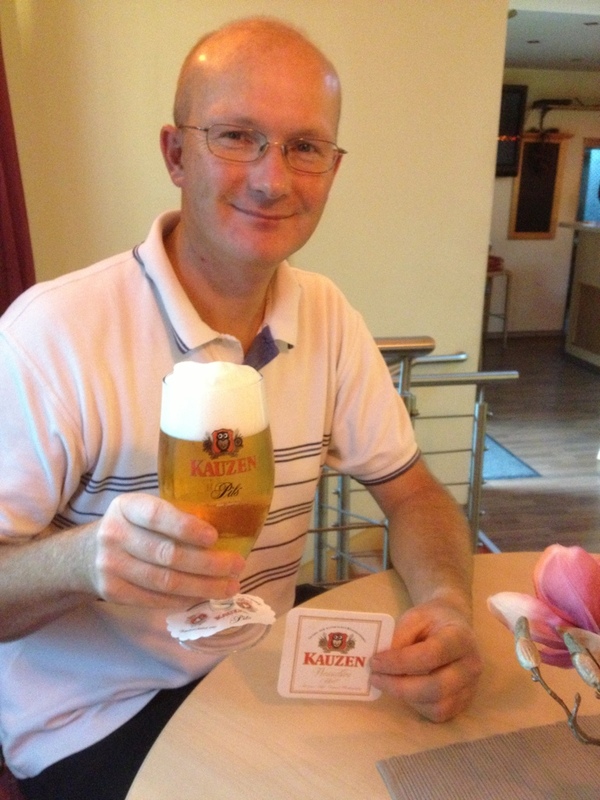 What better trip to choose than Germany’s Romantic Road! 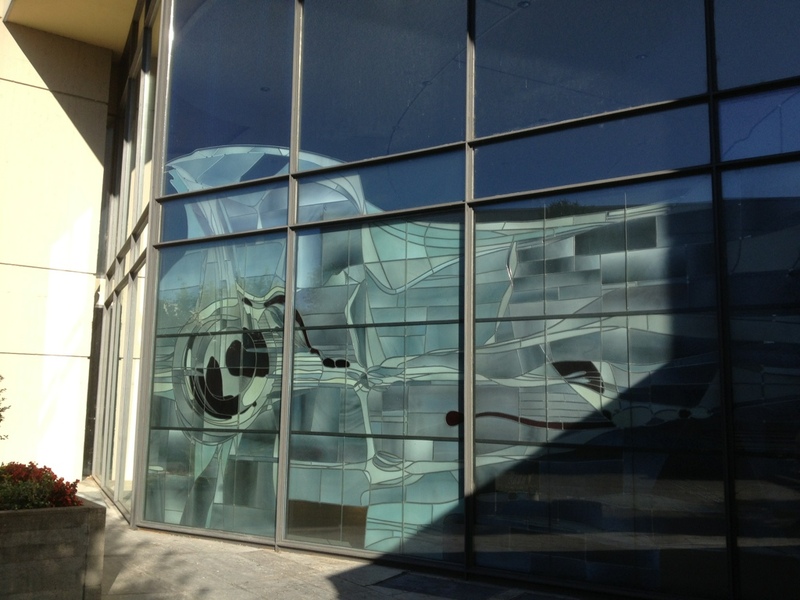 We decided to have a leisurely time this trip and give ourselves plenty of time to relax and enjoy our surroundings. 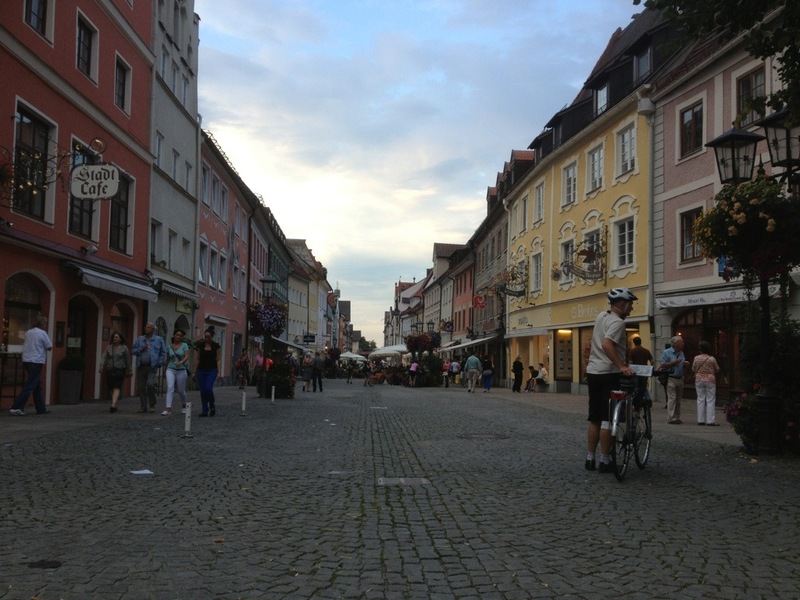 This includes travelling to the start (Füssen in the very south of Bavaria on the border with Austria) so we decided to take three days to get from home in Great Bromley to Füssen. Mind you, the first of those days was largely spent at home with the inlaws (who are house-and-dog-sitting). We didn’t leave for the Harwich ferry until 8:30pm, this time by car but with the bikes in the back. 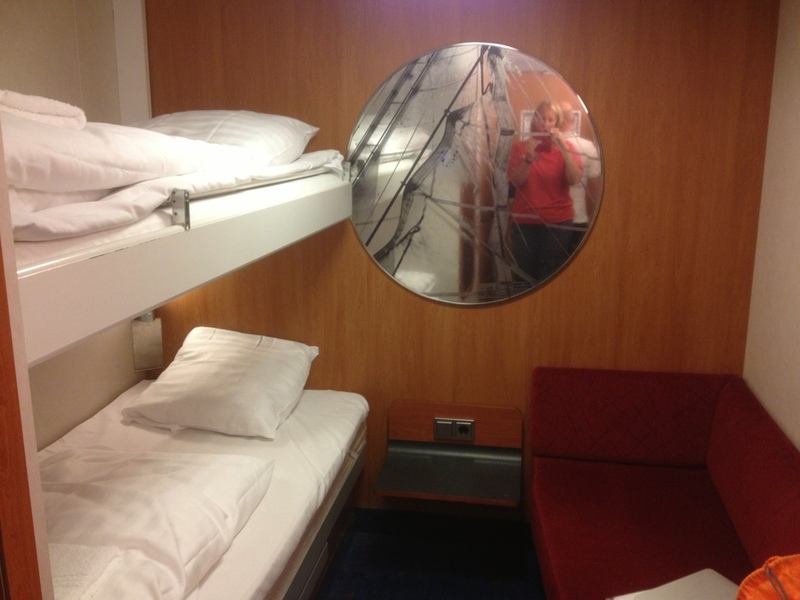 We went straight to our cabin – here is the obligatory shot with me in the mirror! 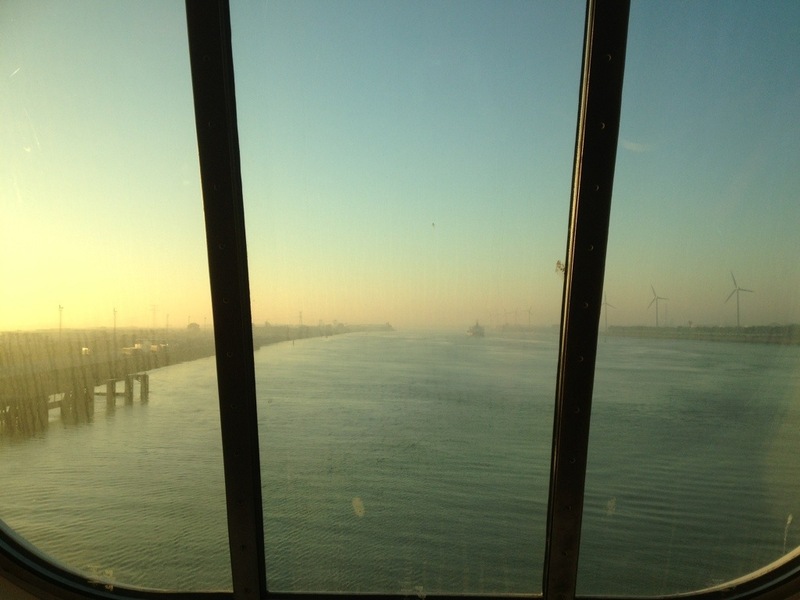 I tend not to sleep too well on the ferry for some reason, and this crossing was no different, so I was awake by 6am. We got ourselves ready and went to the front of the ship to look at the outside world – here’s the view once we were tucked up at the mooring. We were chucked off the ferry at 8am (having a bit of a delay as the whole deck of cars had to wait for the driver of the first car who seemed to have forgotten to make his way to the car deck). We had a couple of Essex Boys in a Dodge Viper car behind us which we expected to zoom past us on the road out of Hoek van Holland but it didn’t. We rolled off the ferry, showed our passports and then headed off on the N220 road which heads towards Rotterdam. 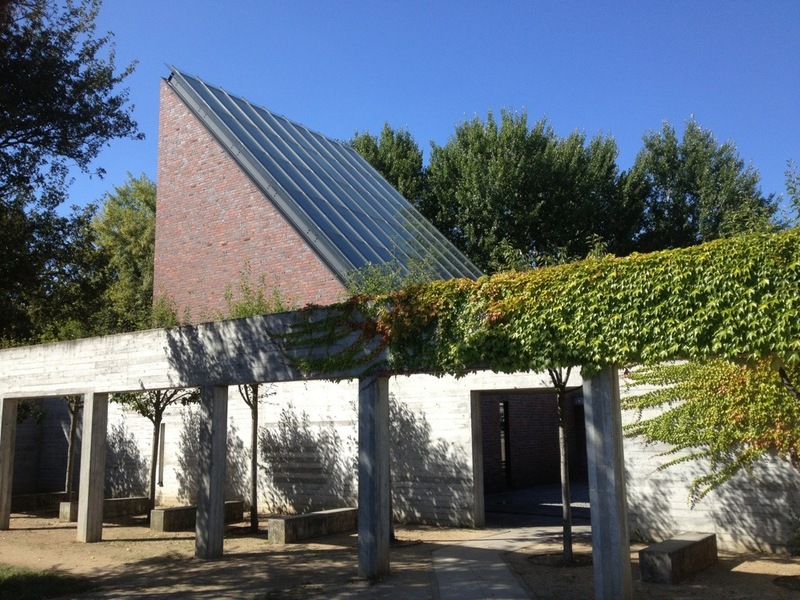 Today we were driving as far as Würzburg at the top end of Bavaria (a little way east of Frankfurt am Main). 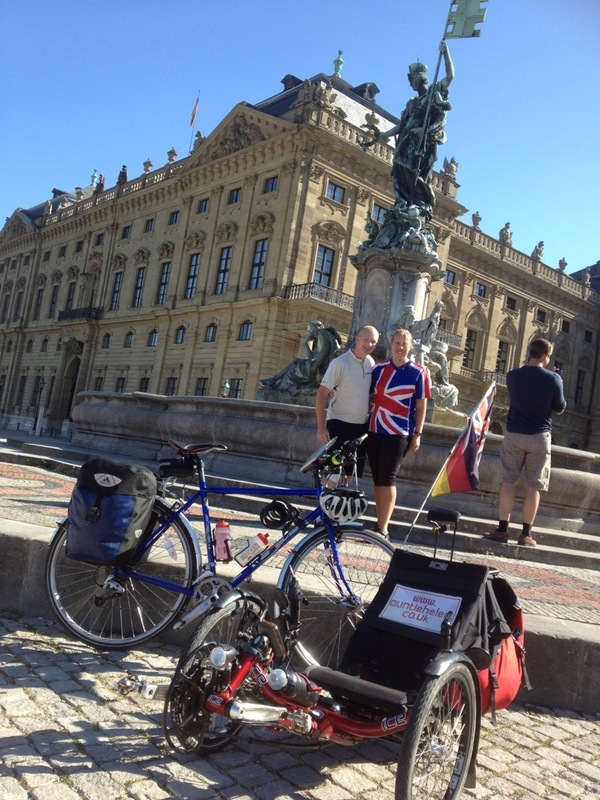 We would stay overnight in Würzburg and then leave the car there and get the train to Füssen, cycling back over a week before collecting the car and driving home again. It was a 370 mile drive from Hoek van Holland to Würzburg which should take us about five and a half hours (according to Google) but it was clear fairly early on that we’d be a bit longer than that as there were lots of roadworks around Rotterdam that delayed us for about an hour over the ten miles that the queues stretched. Still, we had a talking book to listen to and the car is comfortable so it was OK.
We stopped afer two hours for a leg stretch and to change drivers, and then after another two hours stopped again. 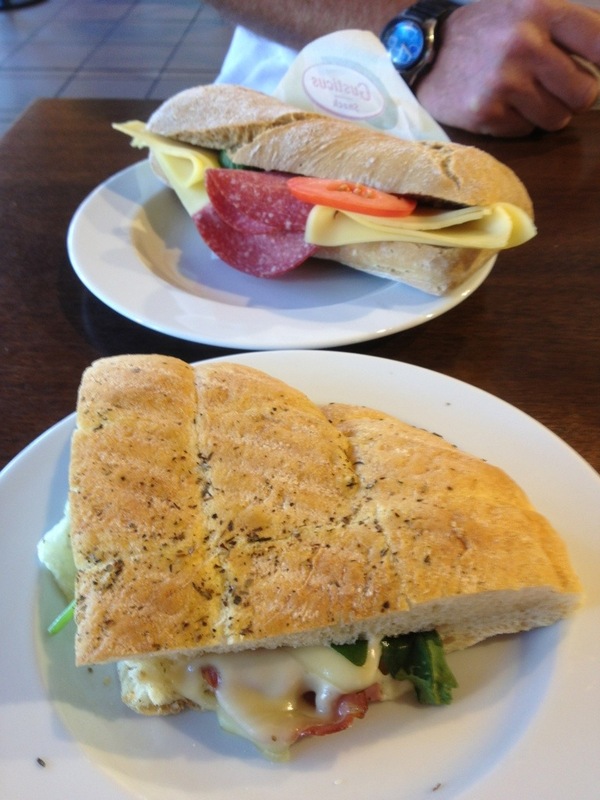 This time we also had a spot of lunch – we were now in Germany so it was time for the cheese and ham to make an appearance. I had a Fladenbrot with cheese. 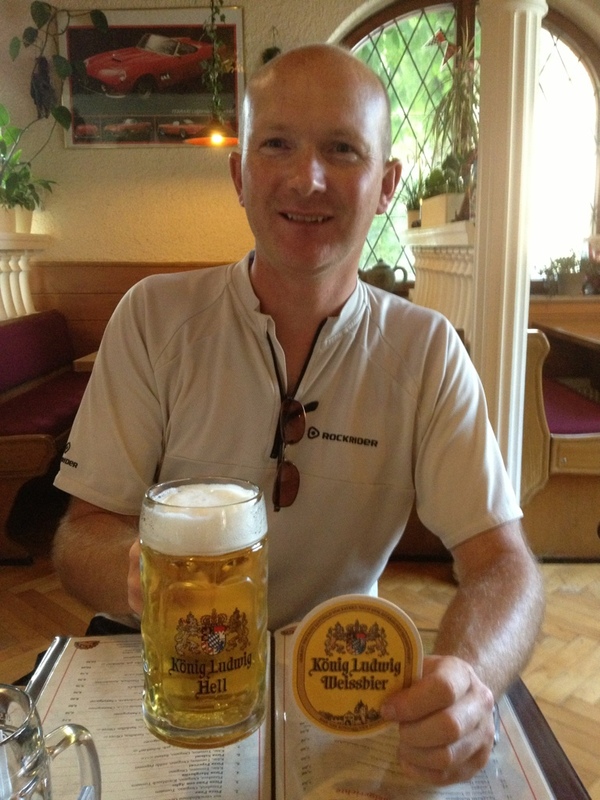 We continued on for another hour and a half before stopping for an ice cream between Wiesbaden and Frankfurt. 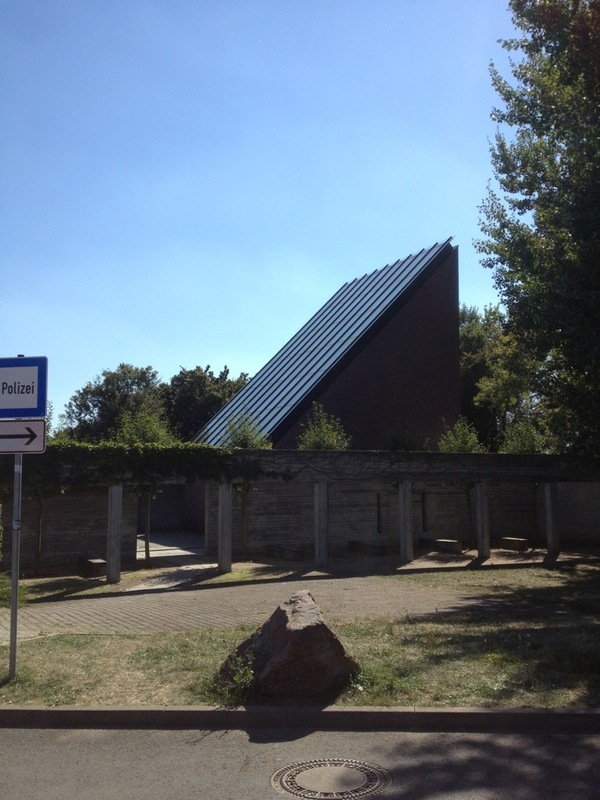 This motorway service station was somewhat unusual as it had a church as part of the buildings. 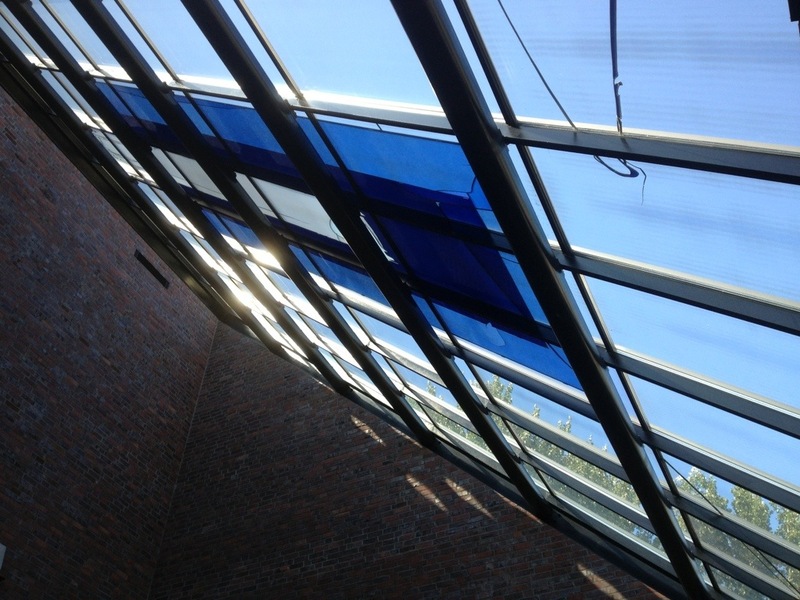 This was the glass roof. 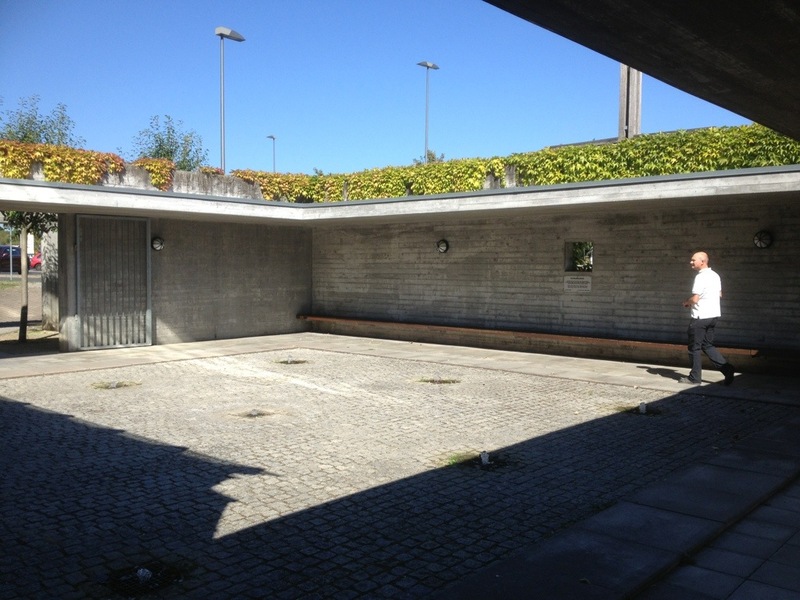 And a pleasant outside courtyard. It was an unusual design and quite small but a nice place to spend five minutes before whizzing along at 80mph again. We were following the motorway the A3 almost the entire way and it was generally a reasonable bit of road althoug with the traditional ridiculously-fast German drivers at times. 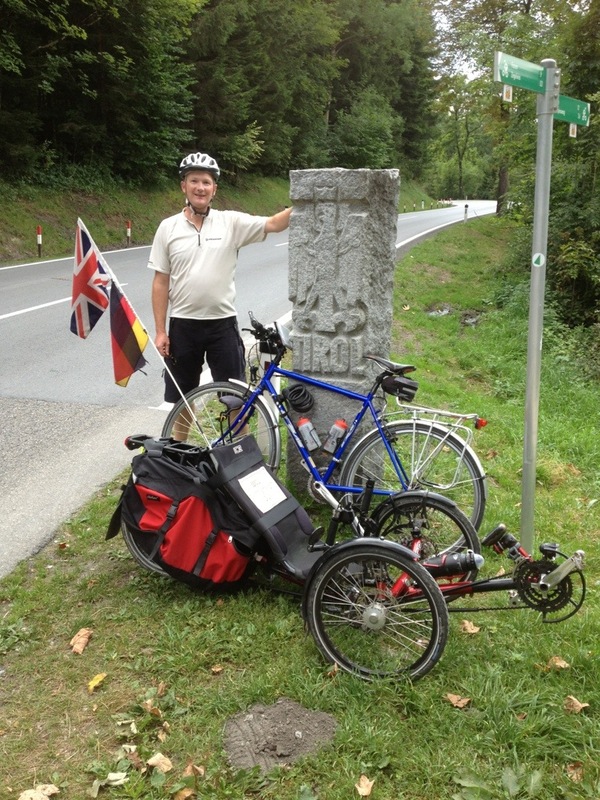 My old Audi A6 trundled along comfortably and James and I enjoyed seeing signs to places we’d previously visited and following our progress on our shiny new Germany road map. 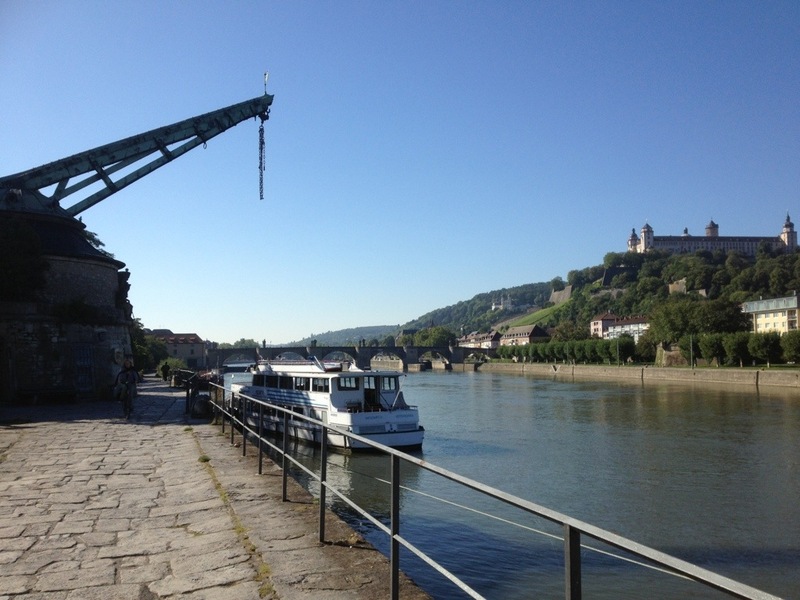 We had a slight navigational issue just as we were heading through Würzburg but were easily able to correct that and arrived safely at our hotel, Lindleinsmühle, where our comfortable room awaited us. 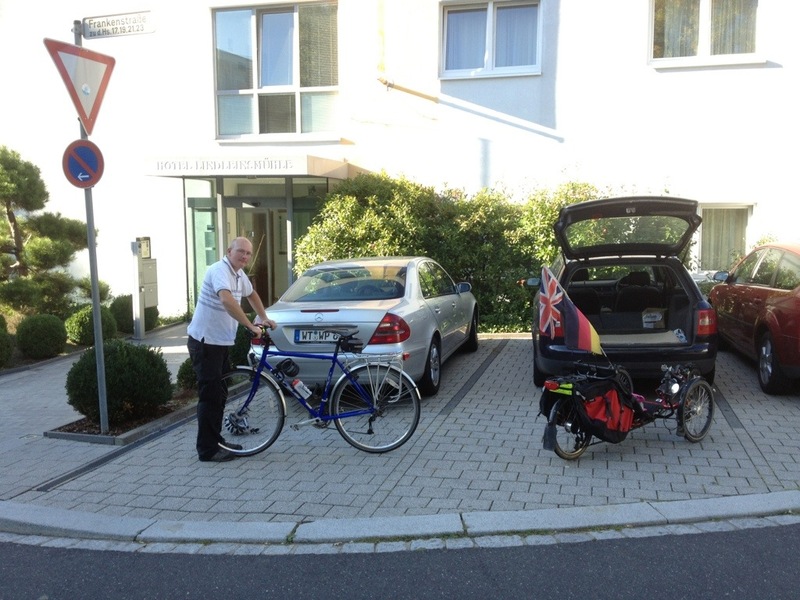 After a bit of a rest it was time to sort out the car – luggage and bikes. 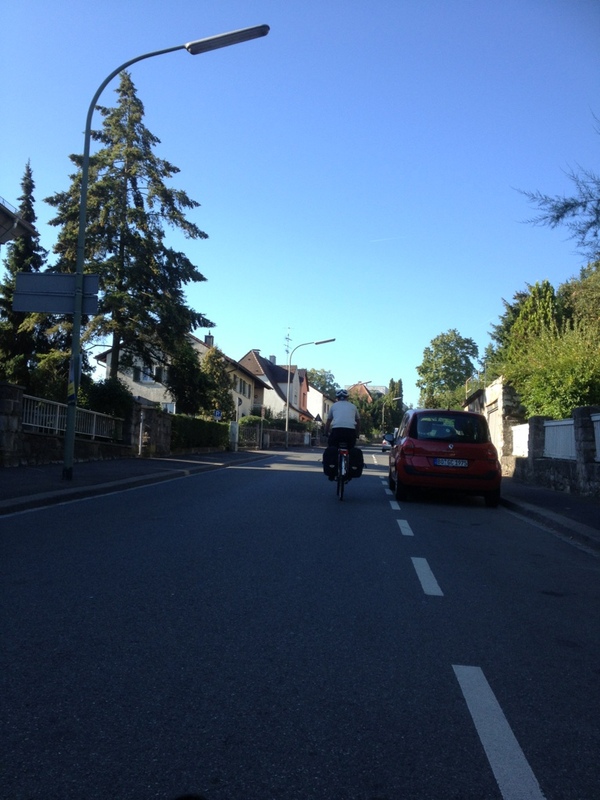 We carried all our luggage up to our room to sort out and then extracted the bikes, put them back together and did a test ride round the cul-de-sac. 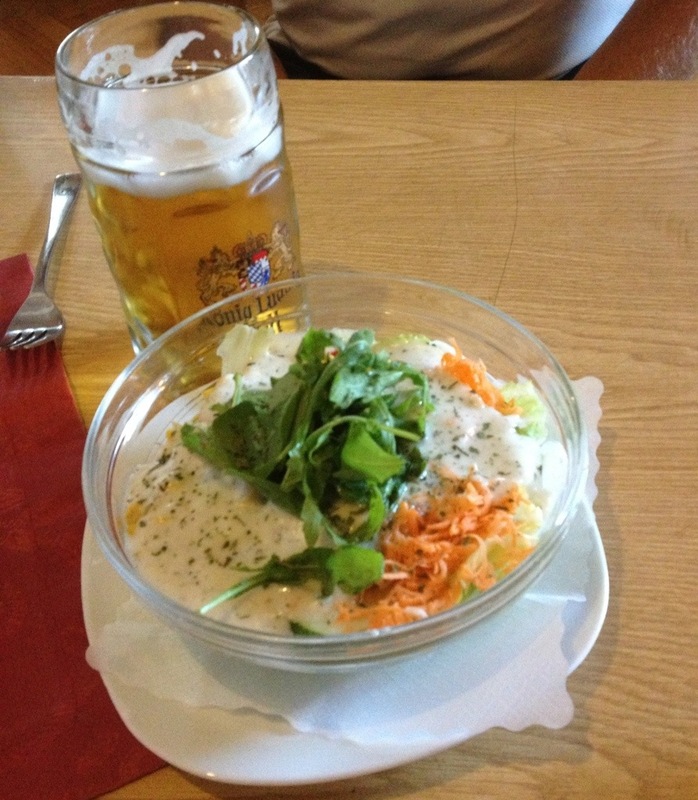 All was fine so it was time to go and have some dinner at the Stübl next door. 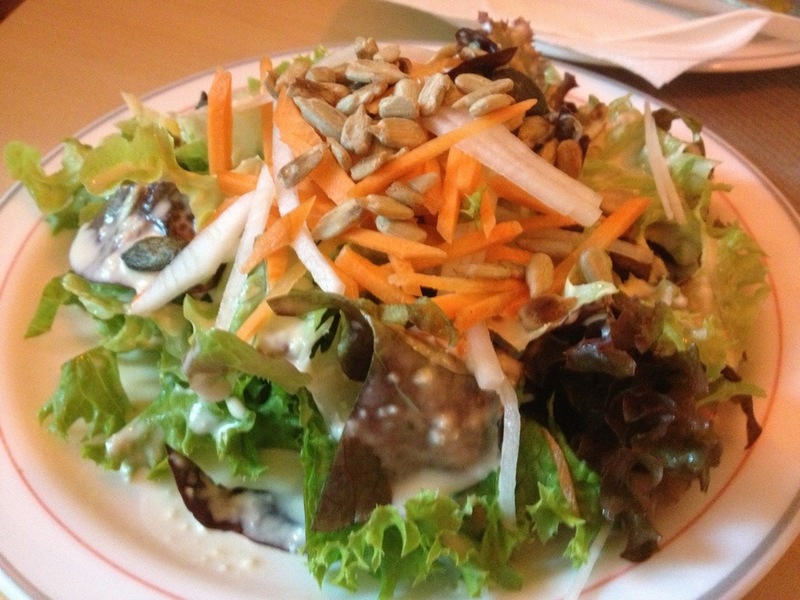 James had ordered a Jägerschitzel so his salad course came first, which he shared with me. 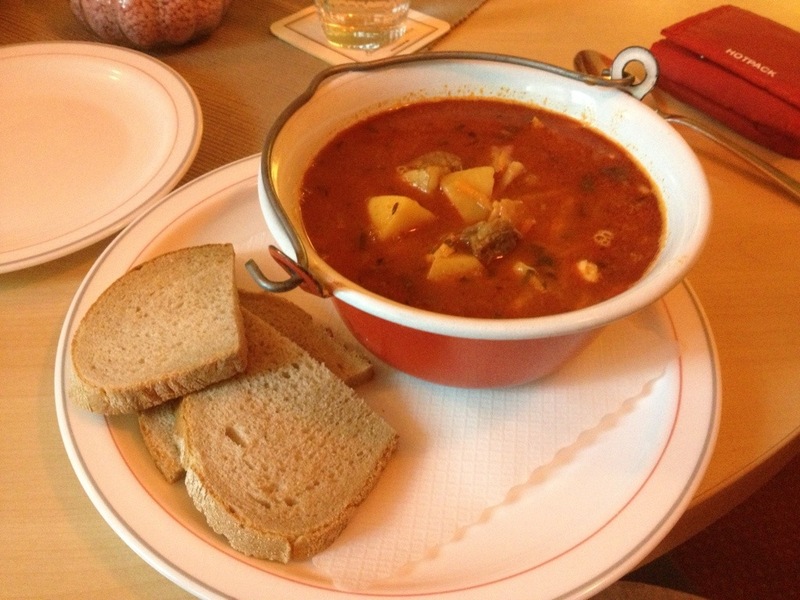 My Gulaschsuppe arrived – it was a full meal with meat, sausages and potato in it. 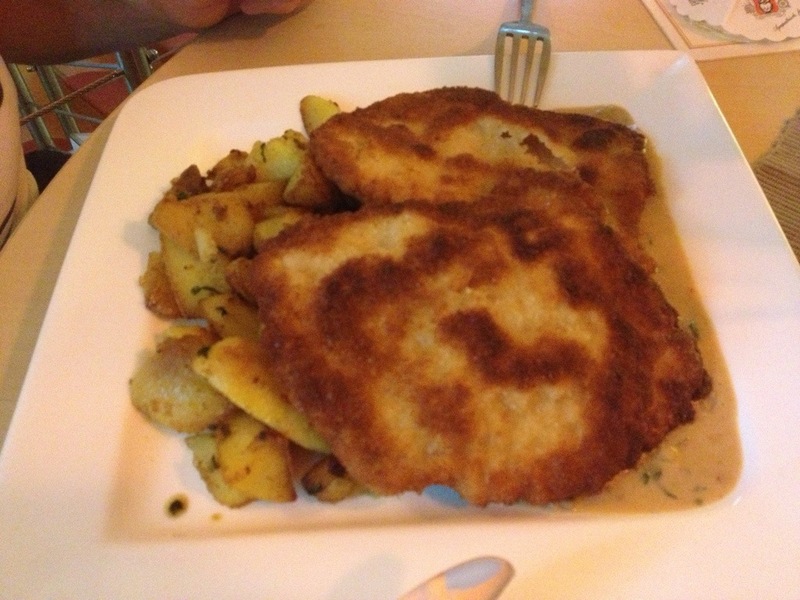 Here is James’s Schnitzel – he shared some of the potatoes with me! On the way back we wandered past a local church with really interesting-looking stained glass but the light was wrong for it – we’ll maybe get a photo tomorrow. But we did see this shop that had my name all over it! 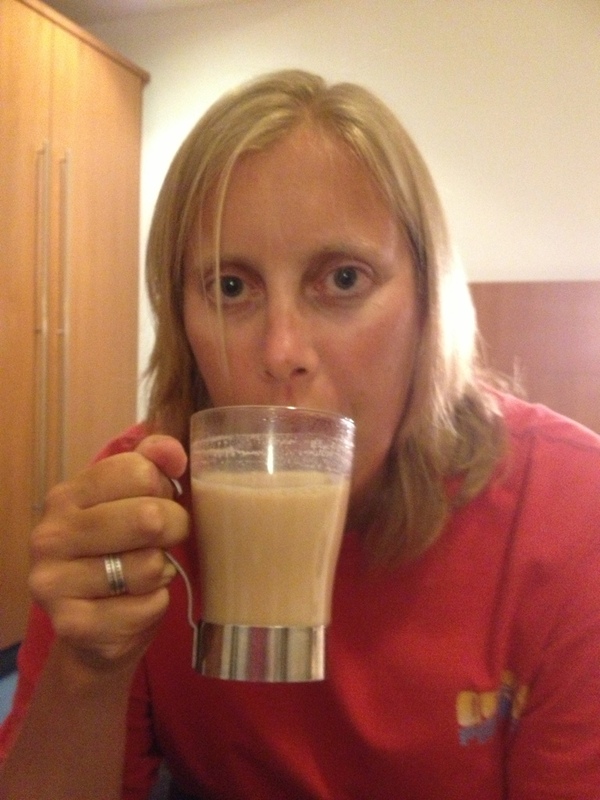 When we got back to the hotel room I decided I needed a cup of tea so went downstairs, teabag in hand, and the receptionist was delighted to oblige. Then it was time for an early night. 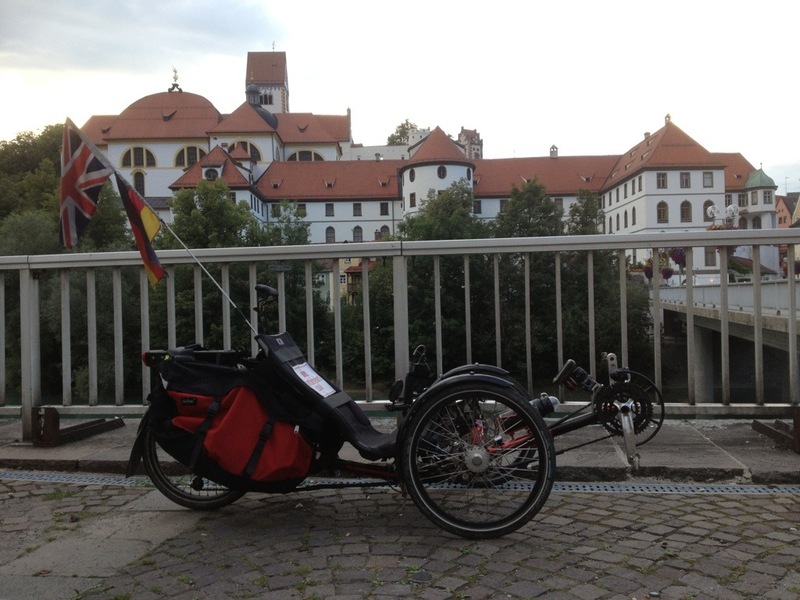 Tomorrow we’ll put anything we don’t need to take in the car (which is now locked away in a covered garage) and then pedal our way to Würzburg railway station to catch our 11:10 train to Füssen. After breakfast we had a fair amount of time before we needed to leave for the train but decided it would be good to have a look around Würzburg rather than wait in the hotel so we got our bikes ready, checked out and popped round the corner to the church with interesting stained glass to see if it was open so we could have a look; unfortunately it was shut but we took a photo from the outside anyway. 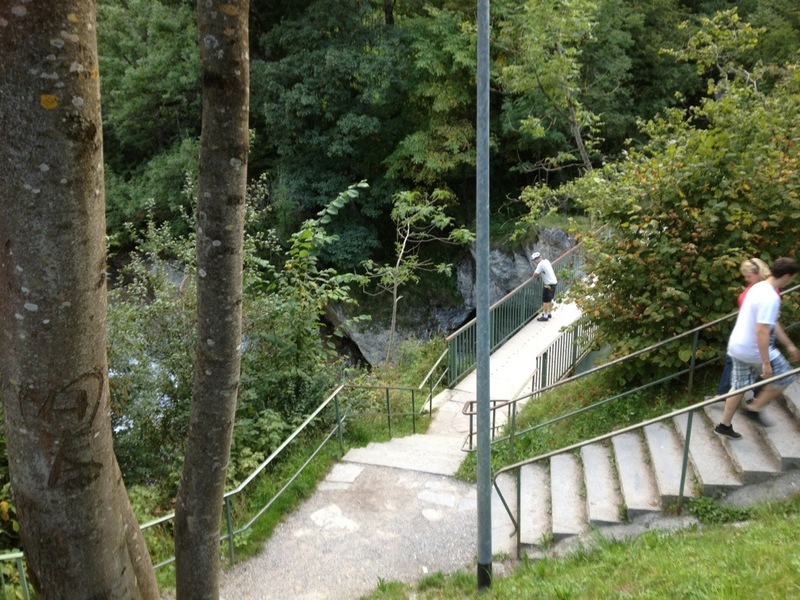 We then headed off up rather a hill before descending the other side. We were aiming first for the railway station to check the train was running OK. The platform had changed but the train was running so that was a relief! 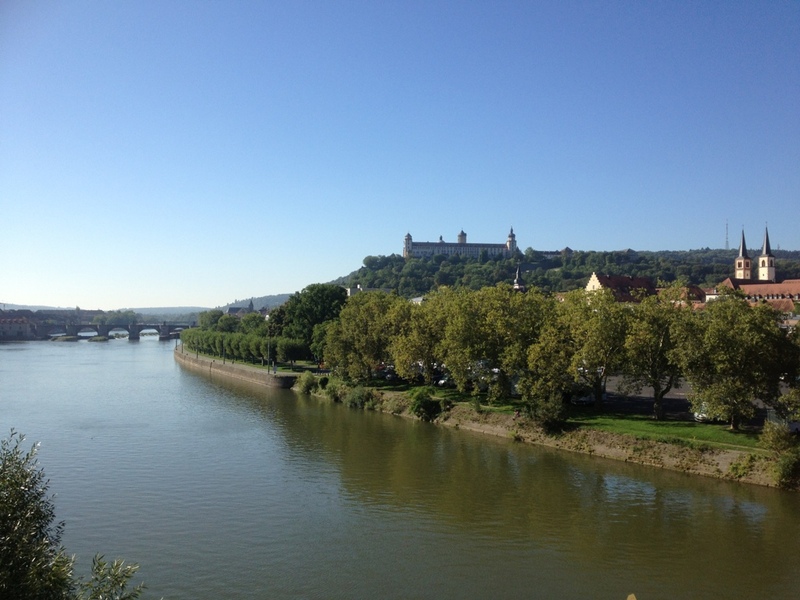 We saw lots of signs on near the railway for various routes including a city round tour but in the end decided to head towards the river Main for a closer look at the huge building which overlooks Würzburg, the 13th century Festung Marienberg (Marienberg fortress). This is always a chance for some photography! We still had half an hour before we needed to get back to the station so decided to make our way to the Residenz, an amazing building that we had visited on our boat tour five years before. We cycled through a park to get there which was rather nice as the day was warming up significantly and the shade was welcome. 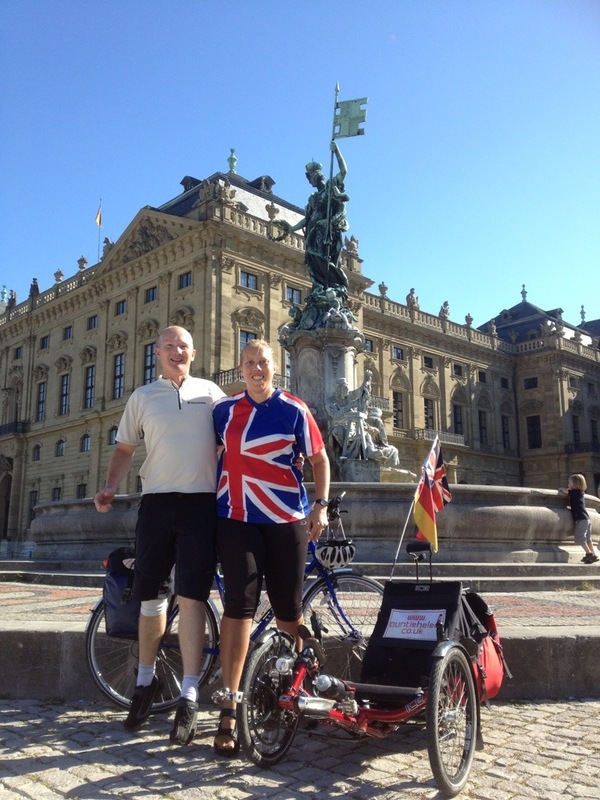 We arrived at the Residenz which was the home of the Prince Bishops from 1720-1744 and is a UNESCO World Heritage site. We took a couple of pics outside it and then saw a lady taking photos so asked her to take a few of us – she was very willing and clearly a bit of a photographer as she got us to jump up for a couple of shots. We took some of her and her guest as well to thank her. Then it was time to head back to the station and find our place on the platform. 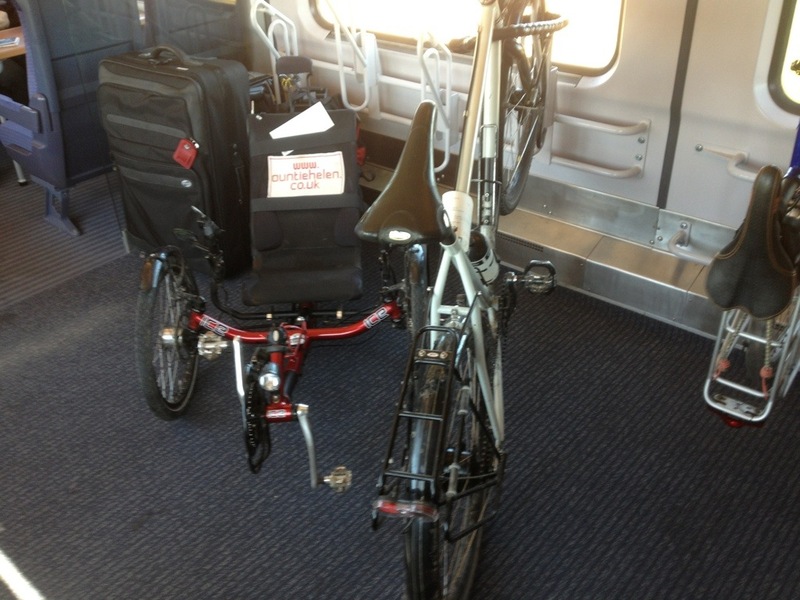 We had to get two trains today and the first was an IC (InterCity) train which I know tend to have narrow doors which is a bit of a pain with my trike as it has to be lifted in on its side. Still, with James around this would be much easier. The train rolled in on time and we found our carriage near the back. 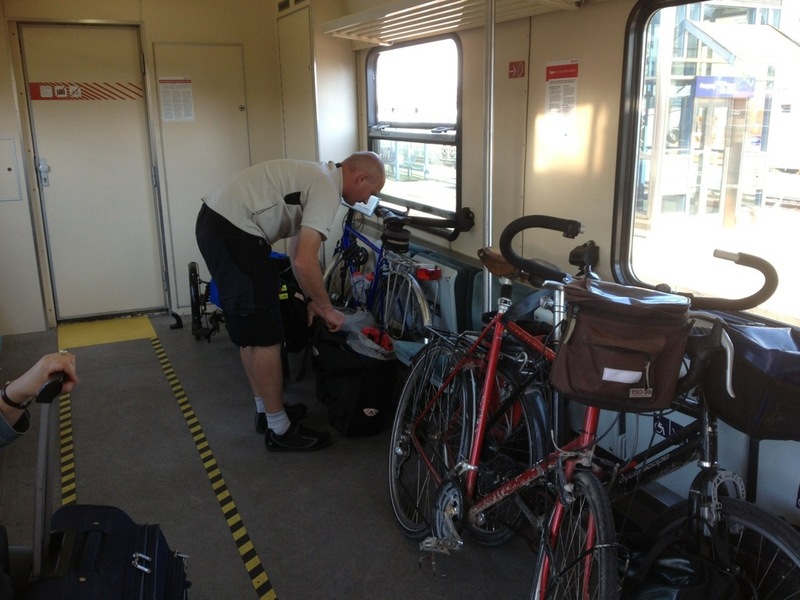 However there were three ladies taking their time at getting their luggage and bicycles out – they clearly hadn’t prepared their stuff for leaving the train. Anyway, they were finally out and I hopped on with my bags, dumped them just inside the compartment and then grabbed the back of Alfie to lift him onto the train with James’s help. At this point the conductor whistled and the doors started closing! 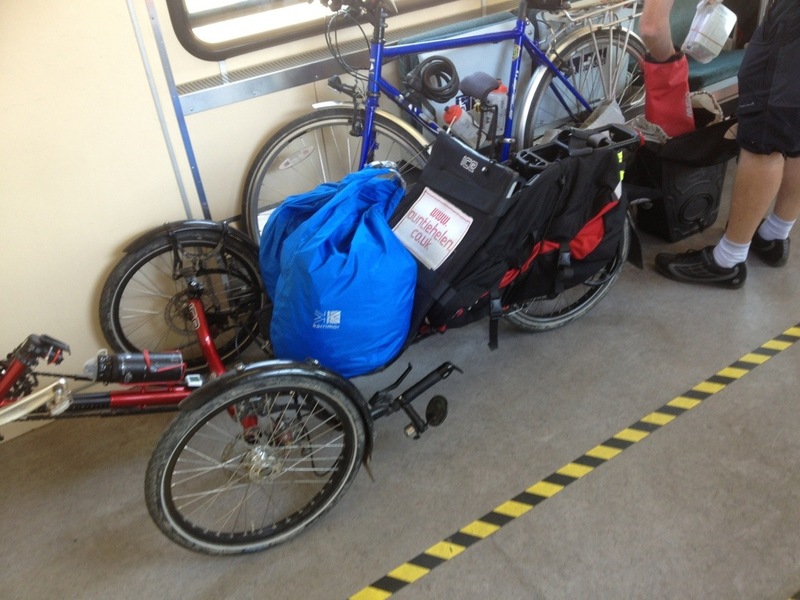 Alfie was half on the train, James’s bike and his luggage and his person were still on the platform! So I kept Alfie in the doorway so the door couldn’t fully close and tried to gain the attention of someone to open the doors again. There was a conductor on the platform not that far away but he didn’t seem to be noticing what was happening. Anyway, they got his attention and he opened the doors. We tipped Alfie up and got him in and I waited by the door as James collected his bike from the platform, at which point the doors started closing again before James was on the train so I put my pedal in the door to stop it. Fortunately the conductor opened it again, James got on and off went the train. The train was comfortable and the route reasonably scenic, starting with a short run along the Main river before it headed southwards through the countryside. When we arrived at Augsburg there was a twenty minute break as the train divided – the front half was heading to Berchtesgaden via München and our section, the back, was heading south-west. We just sat tight and waited for the train to continue. From Augsburg to Buchloe, where we changed, was a fairly short stretch and the landscape was slowly changing from farmland to more grassland. 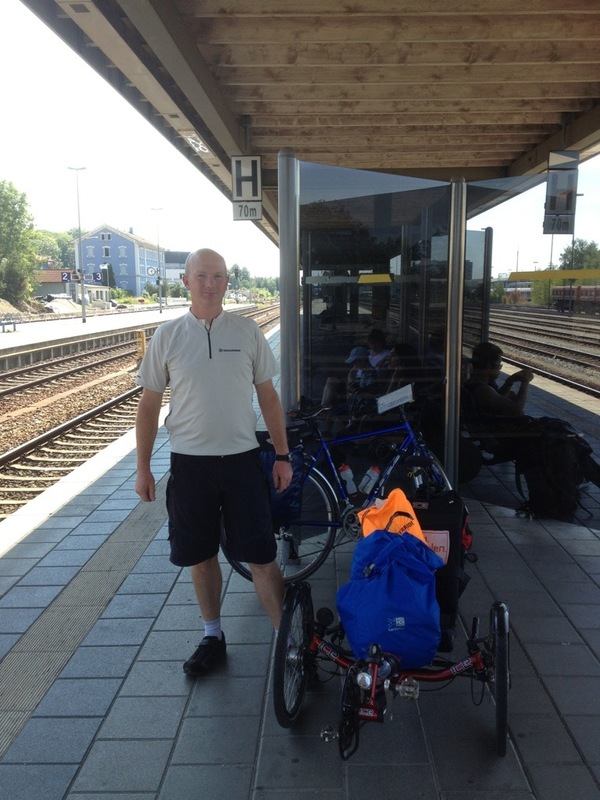 We arrived at Buchloe and it was time to get Alfie out of the train again. James took his bike off first and then my luggage and then one of the passengers helped me move Alfie to the door where James helped lift him down. We were on Platform 4 and had a half hour wait until our next train arrived on the same platform. The train soon arrived and although it was an older style and had double doors there was a metal pole across the middle which meant we still had to tip Alfie on his side. There was a large bike area which we stowed the bikes in and then went to sit in the more comfortable chairs. This was the world’s most rattly train and it was also hot and stuffy – rather an old example of Deutsche Bahn’s rolling stock, I think. This was not helped by my cycling sandals emitting an odour; I’d washed them a few days ago but they seem to have become extra-smelly ever since. 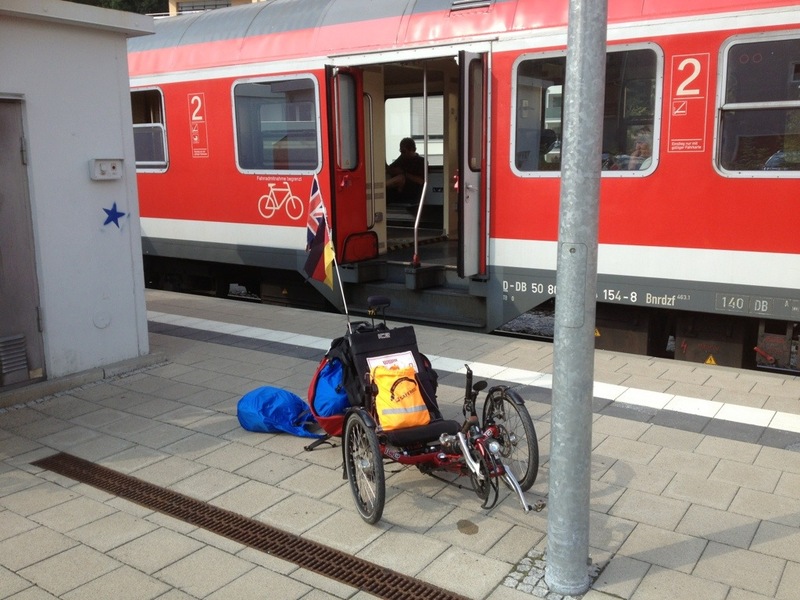 As the train wended its way southwards through rolling hills towards Füssen it actually went a fair bit slower. It was now on single track and we could see lots of rather Austrian-seeming views with green fields with cows, pine forests and pretty church spires. In the distance we could see mountains and they got closer and closer until we approached Füssen. 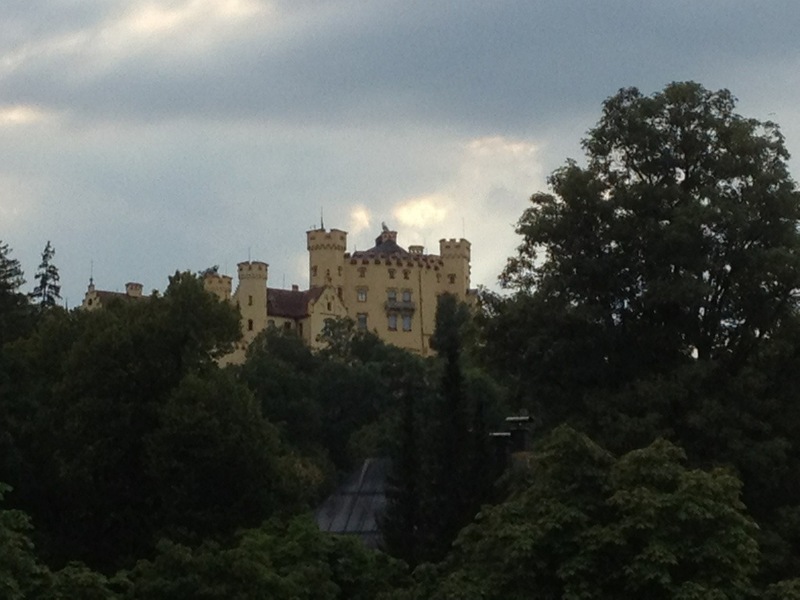 We got a glimpse of castle Neuschwanstein before the train arrived at the railway station and we disembarked. 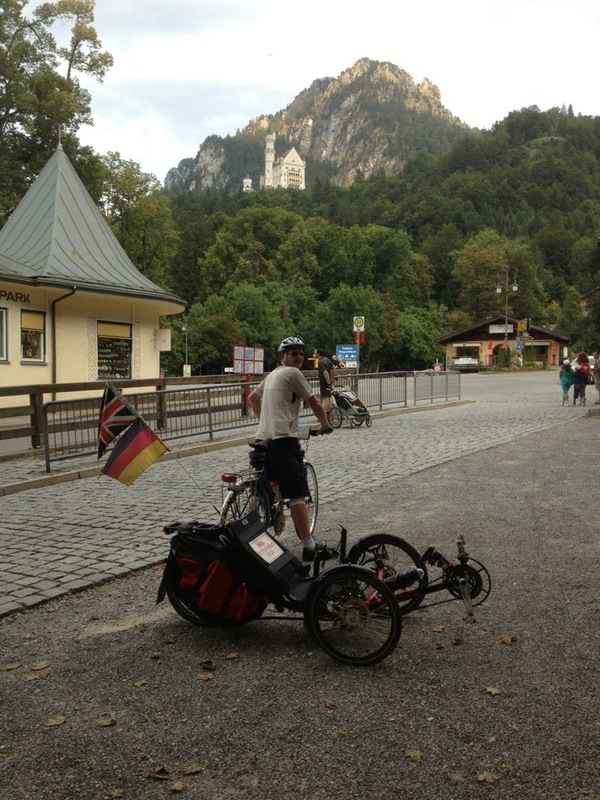 It was just 4pm so we decided it would be good to go back to the hotel and check in and then maybe go out for a ride to see Neuschwanstein and maybe also to visit Austria, just two miles away. We made our way to Hotel Christine and checked in. 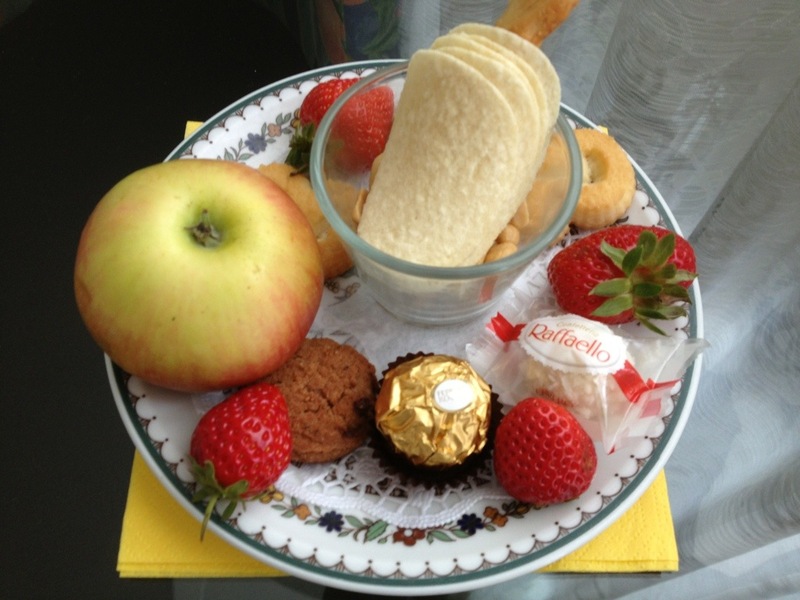 In our room there was a welcome plate of food including pringles, peanuts, strawberries, an apple, chocolate and biscuits. Yum! After a brief break we headed out on the bikes. We had planned to go to Austria first but found an interesting river crossing which put us more on the route to Hohenschwangau (below Neuschwanstein castle) so we decided to go to get a view of Neuschwanstein first. 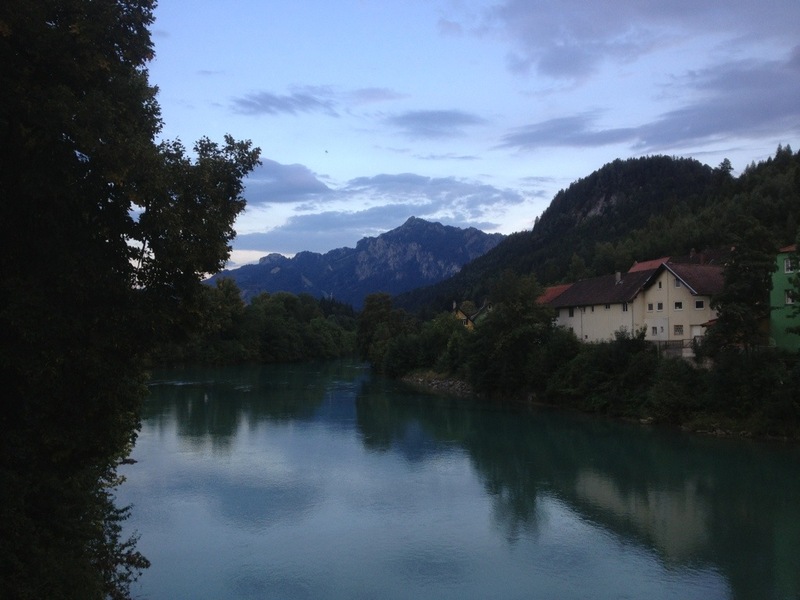 It’s notable that the river/lake around Füssen is a beautiful light blue colour. 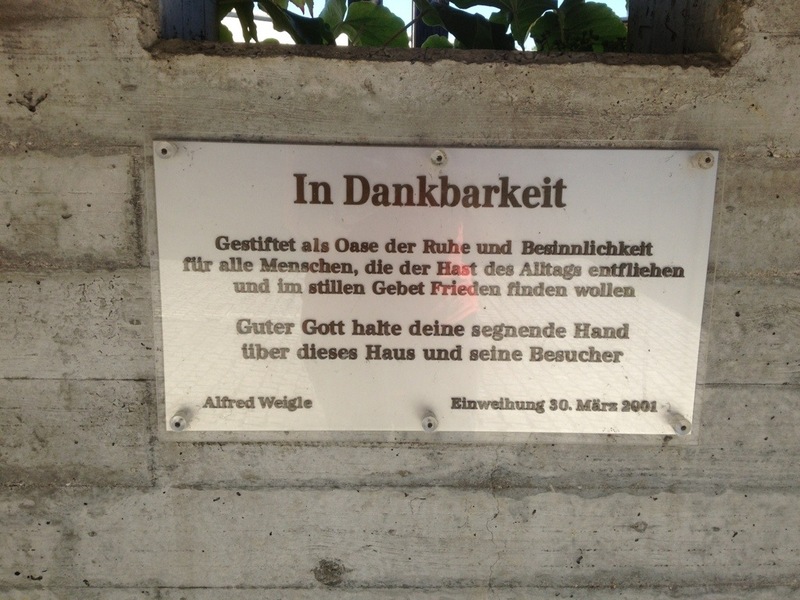 The road to Hohenschwangau is well signposted – including this sign for the Romantische Straße. See behind him – a rather attractive castle on a hill! 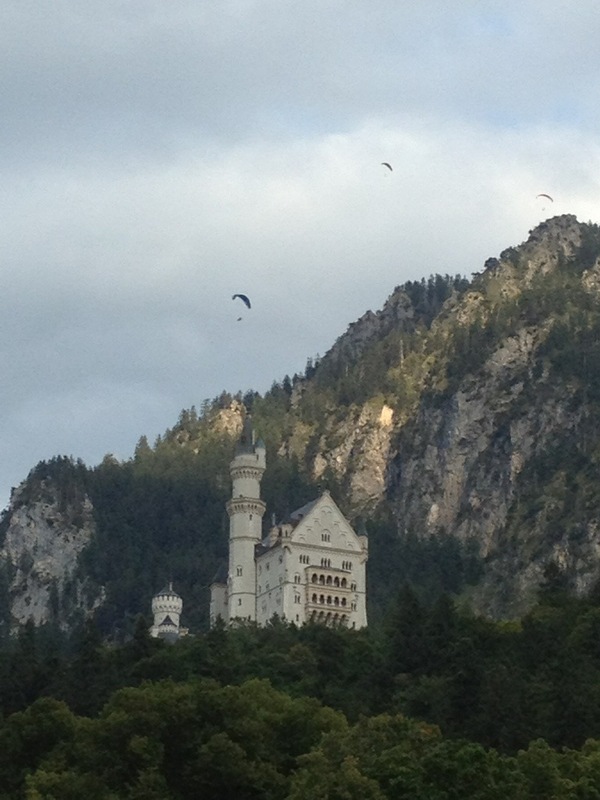 And here is a close-up of Neuschwanstein. We enjoyed seeing this famous building but the clouds were gathering so we thought it was time to head off to Austria. 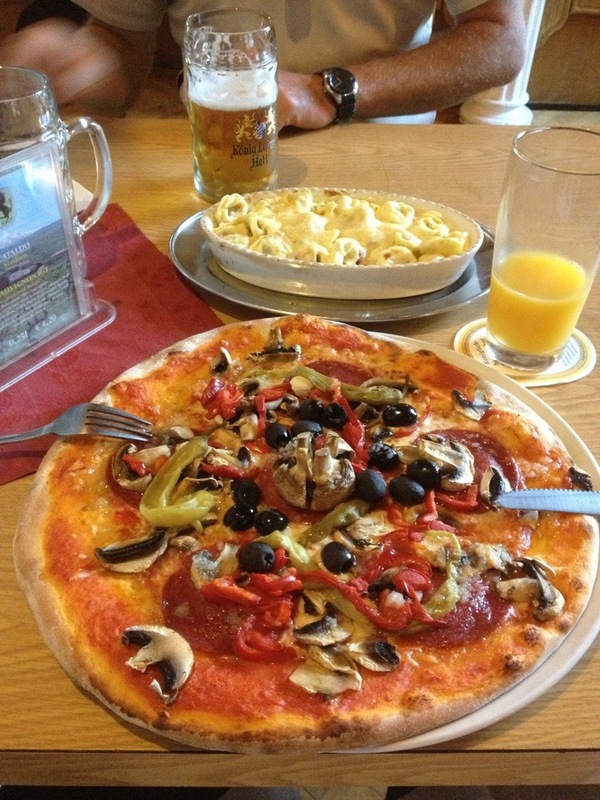 After wandering around in Austria for a minute or so we decided to head back via a pizzeria we had passed. The Pizzeria had a very strong theme of Ferrari cars (including signed photos of Michael Schumacher there). They did a good line in beer for James. We shared a large salad to start. On the way back James had a closer look at the Lech falls. 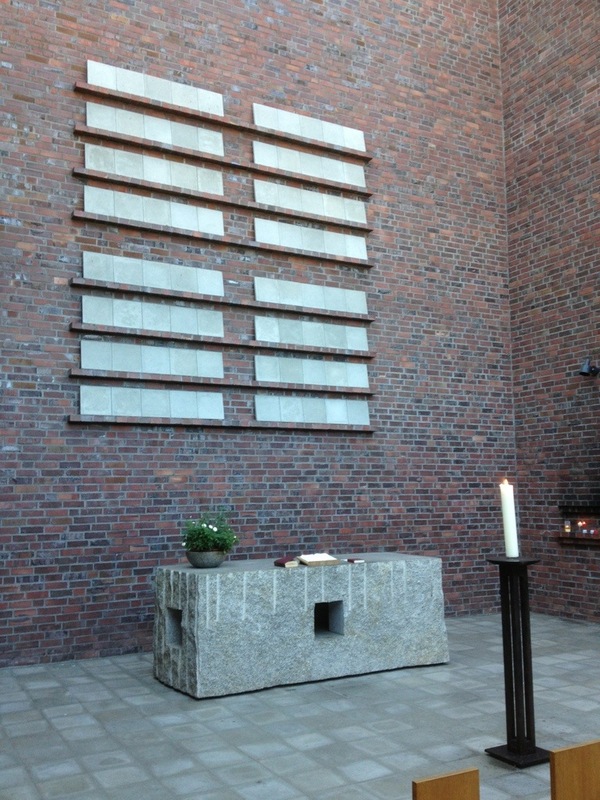 We passed a wonderful monastery called Kloster St Mang whose bells were ringing. 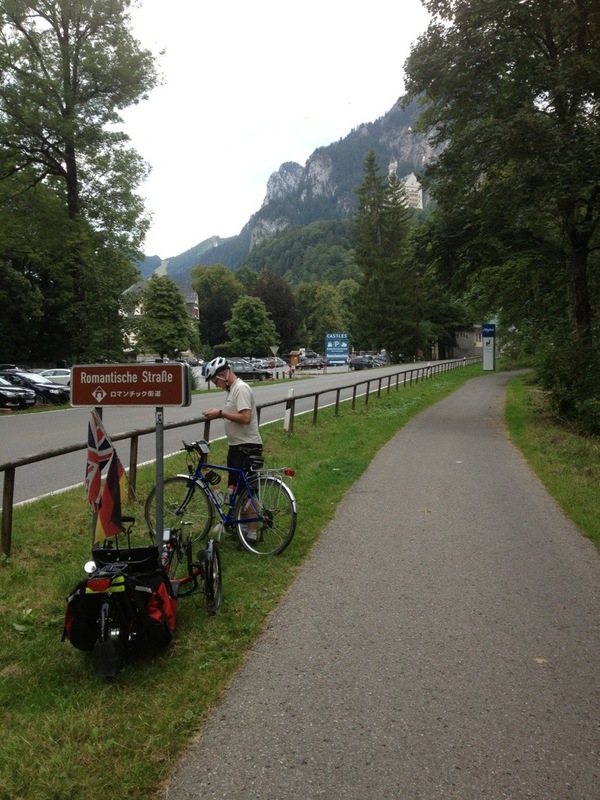 We then had a slow cycle through the pedestrian area which included a short stop to buy some pastries for dessert. 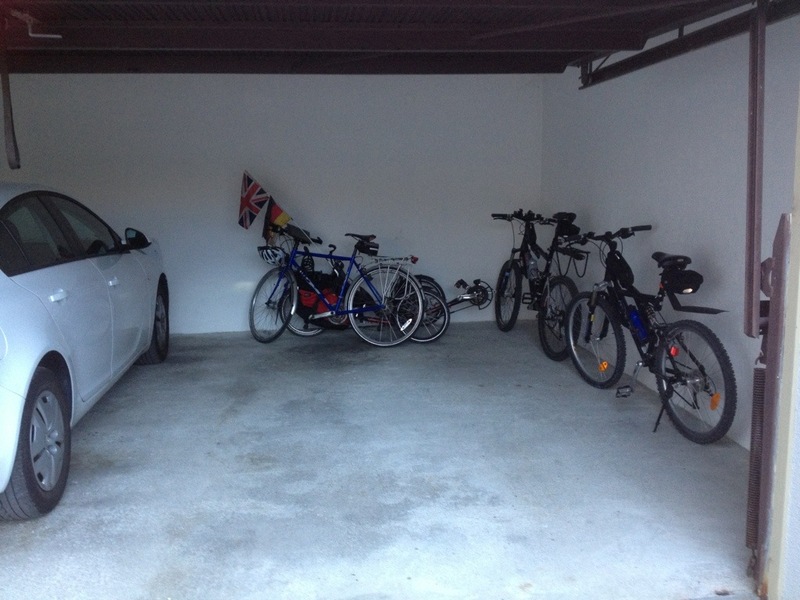 We got back to our hotel and stowed the bikes in the garage. 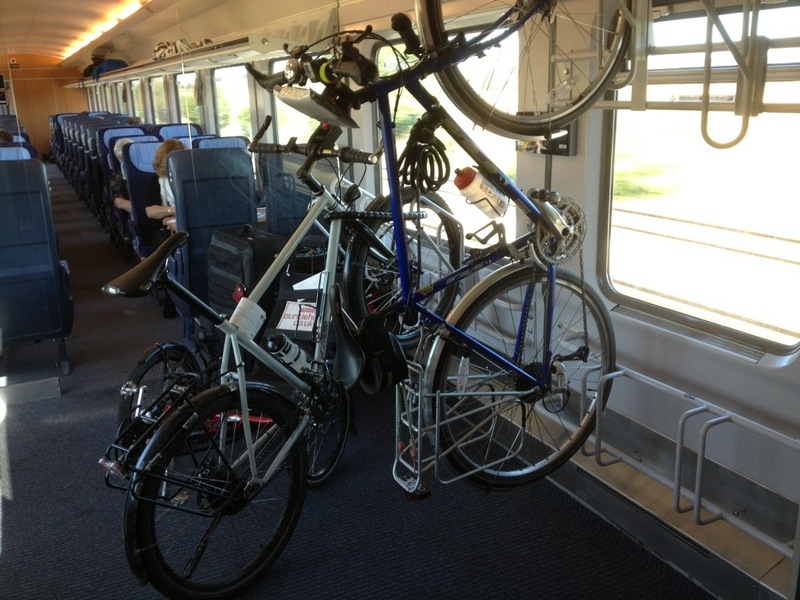 Today we have cycled a total of 15 miles/25 kilometres which is fairly good going for a day of travelling by train too! 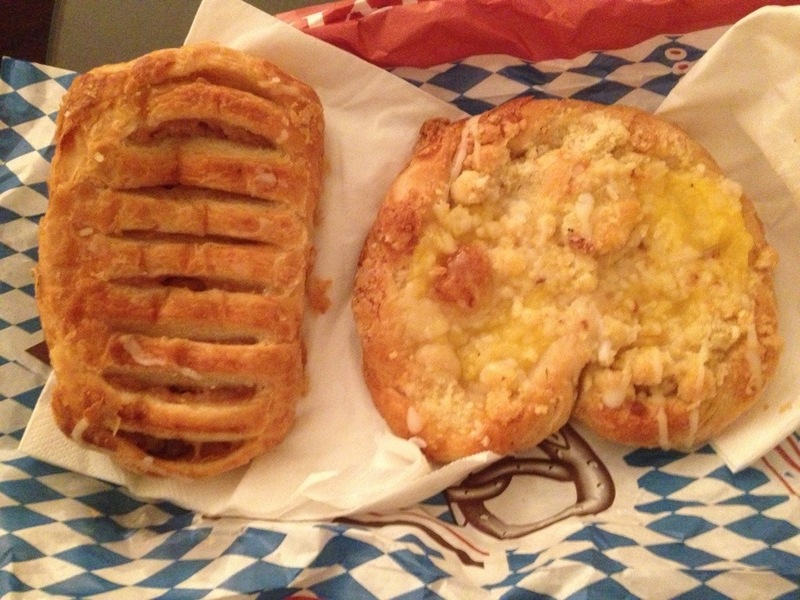 We enjoyed our pastries before going to bed. 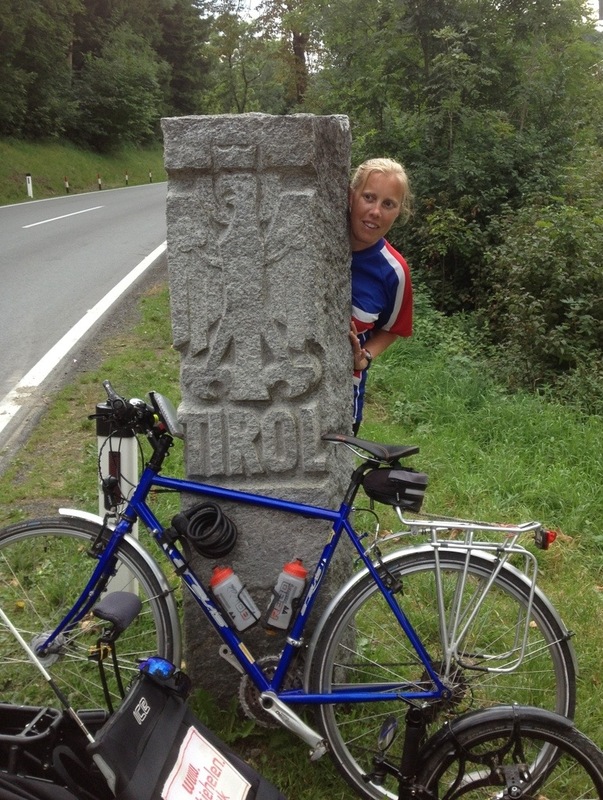 Tomorrow we start the Romantische Straße cycle route proper, next stop Schongau.